There is a lot of debate over what the optimum human diet is, especially when it comes to weight loss. I am of the belief that there is no perfect plan, no one size fits all plan for losing weight. However, I do think that fad diets promising to help you lose X number of pounds in a week or two should be avoided like the plague. That being said, you have to be willing to open your mind to the various options out there and use trail and error to find the one that works for you. In recent years, many are finding that vegetarianism or veganism may be the just they key they need for safe and effective weight loss. A person may have any number of reasons for choosing to eat a plant-based diet. Perhaps they find meat unappetizing, have dairy intolerances or choose to go vegan in an effort to fight against animal cruelty. Many consider a plant-based plan to improve their health by cutting out things like animal fat or trans-fat. 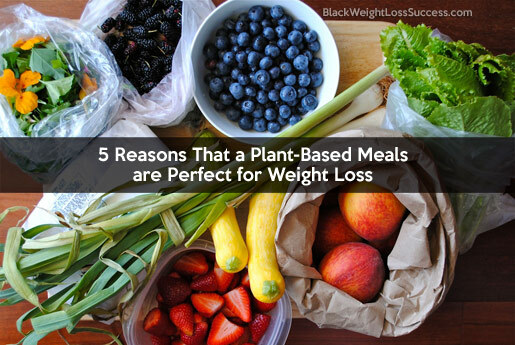 If you are someone struggling to lose weight however, here are 5 reasons to strongly consider eating more plant-based meals. Vegetables, fruits and especially grains are often quite high in dietary fiber, both soluble and insoluble. High fiber foods can make you feel full more quickly and for a longer period of time. Think about the difference in how long you feel satiated when you have a bowl of sugary cereal for breakfast versus having the same size bowl of oatmeal. Oatmeal and other whole grains will keep you full longer. One of the primary reasons a plant-based diet is so great for weight-loss is that your meals will be more filling without sacrificing nutrition and taste. A study featured in the Journal of General Internal Medicine supports this theory, with the study’s main researcher claiming that she believes fiber content is the primary reason for better weight loss results. As you may already know, the key to weight loss is to eat a diet with a caloric deficit in mind- meaning that you eat less calories than you burn. However, you also have to get the right balance of foods in terms of nutrients and vitamins. Vegetables and many fruits are significantly lower in calories than meat and dairy products. It is actually very difficult for the average person to overeat on a plant-based diet since they would have to eat a significantly large portion of vegetables in order to do so. You also get the benefit of all of the vitamins, nutrients and enzymes in fresh veggies. Keep in mind that sweet fruits can be quite high in carbohydrates and throw off your calorie counting if you forget to count them. There are many fruits that are full of fiber and have a lower glycemic index, like berries, cherries and apples that make great choices. Vegetables and fruit both have higher water content than meat and grains. We all know drinking plenty of water is important for health but your water consumption can also affect your weight loss results. A majority of doctors and authorities in the fitness world will wholeheartedly agree that dehydration slows the metabolism, can cause bloat and all in all negatively affect your weight loss results. The age old rule is that the average woman should be drinking eight 8oz cups of water per day. Eating a plant-based diet can give your body more hydration which in turn boosts your metabolism. Expense may not seem like a factor in a diet’s effect on weight loss but it actually can be a very important element of success. Many individuals and families have to be more careful with their money than ever before in these times. Meat, highly processed food and some types of dairy can be quite expensive. A healthy paleo diet, for example, could be quite a bit more expensive than a health vegetarian diet with no organic food. While the price of your food doesn’t exactly affect how much weight you lose, it does affect your ability to stay on track with your diet. A case could be made for almost any popular weight loss plan to be expensive or inexpensive depending on the purchases made, coupling, seasonal purchases, etc. It is unfair to assume that plant-based eating has to be pricey. According to the CDC, a vegetarian diet consists of foods that have a low energy density. Low energy may seem like a bad term when it comes to health but it’s actually a huge benefit. Low energy density foods are low in fat but high in fiber. Low energy, dense foods simply provide less energy per calorie. This combination makes plant-based diets perfect for people who are currently sedentary to moderately active and looking to lose weight. REMEMBER: It is always a good idea to consult your doctor or a dietician if you plan to make a drastic change in your diet, particularly if you are severely overweight, diabetic, are nursing, dealing with high blood pressure and have other health conditions. What Is A Raw Food Diet or Being Raw Vegan? I’m sorry, but we need protein and there’s nothing wrong with grass fed meats. Do your research…I eat organic fruits, veggies and grass fed meat. Eat some fafat, cut sugar/bad carbs, wheat, etc and lose some real weight. #women50+rock! Hi Dwana, I’ve done lots of research. This article is not saying that you shouldn’t eat meat…it’s suggesting that there are benefits to eating more plant-based meals. I thought that was clear. The article is not advocating becoming a vegetarian or a vegan. It is merely offering several reasons for eating more plant based foods and less meat and dairy. Yes we need protein, and there are good meat sources. There are also good plant based sources. I haven’t given up meat but I eat much less than I used to. Great article! Plant-based diets are excellent not only for weight loss but for ultimate health. I’ve lost almost 100 pounds on a Whole Foods Plant Based diet and have dramatically improved my health. One of the many studies to show this is in a book by Dr. T. Colin Campbell called the China Study which was featured in the documentary Forks Over Knives. It is a myth that vegetarians lack protein. There is adequate protein in plant foods whereas Americans overall eat way too much protein because of the emphasis on meat and dairy. Hi I am a vegan and it very hard for now because I’m not getting enough protein in my diet .